Essential viewing, electrifying rivalry, wonderful skills and an excellent advertisement for golf; once again The Solheim Cup delivered three compelling days of golf for fans everywhere. Regrettably, the one black mark over the three days competition concerned more than one controversy concerning the Rules. c. As additional options available only if the ball last crossed the margin of a lateral water hazard, drop a ball outside the water hazard within two club-lengths of and not nearer the hole than (i) the point where the original ball last crossed the margin of the water hazard or (ii) a point on the opposite margin of the water hazard equidistant from the hole. When proceeding under this Rule, the player may lift and clean his ball or substitute a ball. In view of such a basic Rules error having been made, resulting in Ciganda dropping a ball at least 40 yards away from where she was entitled, albeit further away from the hole, it was somewhat surprising that there was not more protest following the end of the day’s play. Ciganda made an unlikely par from the wrong dropping place, scrambling a half with her opponents, Lewis and Thompson, with her partner Petterson, who seemed to be in a better position after two strokes, making bogey. Ciganda and Petterson went on to win this match 1-up. In fact, the main concern raised by US team captain, Meg Mallon, was the disruption to her team’s momentum, caused by the unacceptable time it took to arrive at the (wrong) dropping place. It was therefore ironic, that both she and the European team captain, Liselotte Neumann, were both present and significantly involved in a very similar incident during the second day’s play. This time both Beatriz Recari (Europe) and Cristie Kerr (US) drove their balls into the lateral water hazard on the 16th hole and it took even longer for the players, caddies, team Captains and Rules official to determine the (correct) dropping points. It seems that no-one noticed this breach, which incurs a one stroke penalty, when it happened and in match play it is too late for a claim to be made after any player in the match has made a stroke from the next teeing ground (Rule 2-5). See this link on ‘Ignoring a Breach of Rule in Match Play’. Q. In a match between A and B, B's caddie purports to concede A's next stroke, whereupon A lifts his ball. What is the ruling? A. As a player's caddie does not have the authority to make a concession, the purported concession is invalid. As A had reasonably believed his next stroke had been conceded, in equity (Rule 1-4), A incurs no penalty and must replace the ball. B incurs no penalty; however, had B's caddie lifted A's ball, B would have incurred a one-stroke penalty under Rule 18-3b. Rule 2-4 does not cover the question of whether a player may putt out after his next stroke has been conceded. A player incurs no penalty for holing out in such circumstances. However, if the act would be of assistance to a partner in a four-ball or best-ball match, the partner is, in equity (Rule 1-4), disqualified for the hole. An argument ensued as a result of this unsavory episode and it was suggested that the Europeans should forfeit the hole for receiving advice. However, as I covered in a recent blog, a first instance of unsolicited advice from an outside agency does not incur a penalty. I think that most viewers of this incident sighed with relief when play eventually resumed and Lexi Thompson made her putt anyway, understandably celebrating with an expressive fist pump. 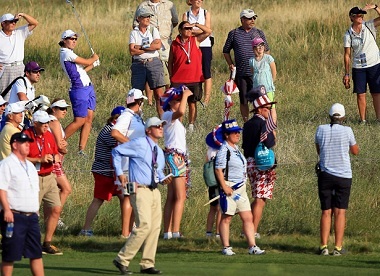 Her win on this hole brought the match back to even, but the Europeans eventually won, 2 up. Finally, I want to draw attention to incorrect comments that I heard more than once from the SKY TV commentators, which to be fair to them was a minor blemish on what I though was very good coverage, with many interesting experts contributions, including Christina Kim, who belied her on-course personality by being calm, even-handed, informative and articulate. Despite what some commentators may think there is no Rule that prohibits making a practice putt on the putting green following completion of the hole in stroke play, but permits the same action in match play, including the Solheim Cup. Rule 7-2a permits practice putting or chipping on or near the putting green of the hole last played between the play of two holes in both formats of the game. The reason for this widespread misunderstanding is that for most stroke play Tour events a Condition of Competition operates, prohibiting players from practicing after they have holed out, to avoid slowing down play even further. US Residents Only: I am pleased to recommend a product on the Rules of Golf that I have recently discovered. It is a game based on flash cards, “Golf Rules! Know the Game?”, from Kent Matsumoto and Mark Freshwater. You can find out all about this Rules game from this web site; http://www.golfrulesgame.com. Unfortunately, due to USGA licensing restrictions, ‘Golf Rules! Know the Game?’ is only offered for sale in the United States, which seems a shame when the objective is to help others obtain a better understanding of the Rules of Golf, which are now totally unified across the world. Thanks as always for your very informative blog which I look forward to. The 7th is a par 5, and Paula Creamer's putt was for par. The Europeans had scored a conceded birdie already. The only purpose in Creamer putting was to give her partner (who had a birdie putt - subsequently made for a half) the line. Now, while there may be nothing specific in the rules for such a proposed action, I think it is at least a breach of etiquette (to putt in such circumstances) and I also think that if there is a decision for the more blatant action in 30 3f6, there should possibly be a decision around this potentially unsporting action as well? "27 minutes to reach a decision"
I love that the officials take the time to get it right (27 minutes is absurd in any situation). But taking the time and getting it wrong? I note that I got the facts of this incident slightly wrong in that Lexi Thompson's putt was for birdie and a half (which I have now corrected). I don't disagree with what you have said, but the main point is that it has to be the players that concede a putt and not the caddies, or the assistant team manager. I think that the US lack of match play experience may be a factor here. Apparently, one US team member had never played match play before! Creamer did indeed pick-up after the concession, which as you point out she had to, so as to avoid her partner, Lexi Thompson, being disqualified from the hole.
" One of the European players was asked to lift her ball because it was close to the ball of the US player, who was first to play. She lifted her ball and passed it to her caddie, who immediately began cleaning it with a towel. " I did not see this, but same happened to US team. Kerr and Wie hit balls that ended inches from each other. Kerr lifted her ball and tossed it to her caddie who cleaned the ball. The Sky commentators (Murray?) noticed this and so did Xtina Kim also. Luckily Kerr did not putt his ball into hole off the green. Golf gods did not let it happen. Yes, I think that this was the same incident, which I wrongly attributed to a European player. However, someone else has said that the ball had been moved by the other ball before it came to rest close by. If that was the case then the player/caddie was entitled to clean the ball, as it had been lifted under Rule 18-5 and not 22-2 as we had assumed. I am shocked that you have not removed the incorrect details of the incident re cleaning the ball from your main report. The officials receive enough "stick" from the commentators , who once again , are the people who get things wrong but never apologise or correct their errors. I have not removed any details because only one other person has commented that the commentators and I were probably wrong in our reporting of the incident, and if you read the comment immediately above yours you will see that I did clarify that the player was entitled to clean her ball if it had been moved by the other ball. However, I have not been able to confirm that this was the case. Perhaps you have some concrete evidence.